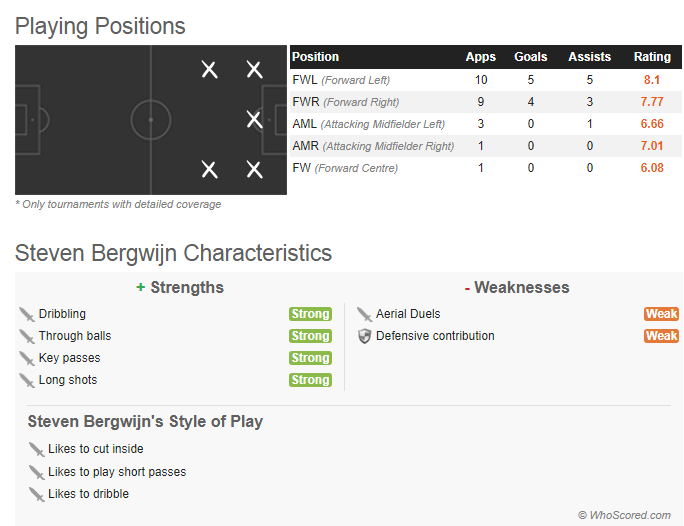 The Dutchman is a winger, who likes to cut inside and operate centrally. He is quite a versatile attacker, having played as a secondary striker and even as a false nine during his time with PSV Eindhoven. Bergwijn is proficient in drifting past defenders using his trickery and acceleration in the final third. He has averaged nearly three successful dribbles per game this season – more than any other Manchester United player this season. And thanks to the nature of his gameplay, the 21-year-old often finds himself in such a position, where it becomes easy for his team to initiate a counter-attack. This could prove to be priceless for United, considering how they have struggled with Romelu Lukaku’s lack of form. The PSV starlet has a good positional sense as he often tends to be at the right place to make the most effective run. This becomes prevalent especially in wider positions where the 21-year-old often uses hold up play in order to allow the full-backs to make overlapping runs down the flanks, which tunes in well with the brand of football Manchester United have shown under Solskjaer. But most importantly, it is Bergwijn’s productivity in the final third that makes him a good target for the Red Devils. The Dutch international has averaged 2.4 key passes per game, which shows his creativity, and he averages 2.9 shots per game which reflects his ability to get into good positions to test the ‘keeper. Considering all his abilities, he’d be a good fit at Manchester United. From what I saw on YouTube, he is a pure LW and 75% of the chances he creates and goals he scored are after cutting in from left side so he can use his right foot. And to be honest we don't need a new LW, we need cb, fullback, dm and a RW. He is at his best on the left and obviously would not be an improvement on Martial. Backup to Rashford and Martial, I'd be fine with it, we need left-footed player so badly. On the rare occasion where I have watched PSV and NL, he was good. If the fee is good, it's a decent gamble. Why not push out the boat for Leon Bailey instead? I don't see any place for Bergwijn at United at the moment. If Rashford is now being considered as a number 9 only (which he should be) I wouldn't be against us bringing in a young prospect to give Martial some competition. Alexis for me needs to be sold. I don't want him upfront for us, on the left before Martial so that only leaves RW where he's barely played at for years and apparently isn't keen playing there either. He's been a huge flop for us sadly. He plays on the right just as much as the left. Nah him and his agent are probably trying to get out of Holland. Looks slow, like Malcom and Memphis. He isn´t slow, he lacks a bit of burst at the start but he isn´t slow by any means. Still don´t see why we would sign him. Hope it's just rumors. We don't need him. I'd rather we go for Hirving Lozano. Plays on the right more often and I think he's better. That's the most important aspect of pace. He doesn't look like he has that burst of speed over ten yards. That's a huge reason Memphis struggled and why Malcom looks so ordinary. Definitely I see this ending with him signing for a Sevilla, Lyon, Hoffenheim level club in the summer. from the highlights he seems right footed mostly and a classic cut in from wide which would make the left side his better nominal position. Tends to turn when he has to use his left to whip a cross in. He may or may not be any good but I just don’t trust performances in the Dutch league as an indicator of how good an attacking player is. I think Bergwijn's ceiling is much higher. Made tremendous progress over the last year. But i do agree there's no place for him at United at the moment. He has a similar playing style to Martial, but isn't at his level (yet). He looks really raw, nowhere near ready for the PL. He's also very right footed, he wouldn't be good enough straight away to come in and displace Martial from the team. Unless we sell Sanchez and buy him, he'd cost a pretty penny I'm sure. From the video he looks like a player we might have been watching in case Martial didn't re-sign. Seems like he could be a great squad player for us currently. Powerful shot on him too. A pretty decent highlights reel for a 21 year old. Id say he's an upgrade on Lingard with the potential to be a starter. Looks like a fine talent. We need individualists and he's certainly that. I think he could become a great player but i also think we dont need a LW who likes to move towards the centre. Not sure about Lozano, good player but Bergwijn looks like the more talented player. Both will be sold for a lot of money though. He's not the answer to our RW issues, as someone else said, we don't need him ATM, maybe, if god forbid Martial leaves he could be an option.